For most people, the goal of working out is not to be as strong as possible. Usually, it’s simply to look good in bed. But even if being strong is not your top priority, having a foundation of strength and power is vital. It will increase your workload capacity and help you take your physique to the next level. So obviously you should incorporate some strength based training into your workouts, but what are the best exercises? The best strength exercises are multi-joint movements that recruit a large amount of muscle fibers. Here are some of the most effective movements and building strength. These are two essential exercises for anyone looking to build strength. Squatting heavy requires your glutes, hips, quads, and hamstrings to work together while forcing your core muscles to function in unison by creating a braced neutral core to protect the spine. Deadlifts will activate the same muscles with more of an emphasis on the posterior chain (hamstrings, glutes, erector muscles in the back). In addition to building muscular strength, these two movements are the best at strengthening your central nervous system. 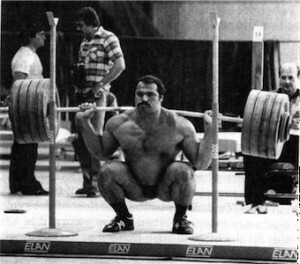 As essential as these movements are, more people probably injure themselves doing these two lifts than any other exercise. As a result, many people try to “work around” deadlifts and squats by using exercises such as leg press and back extensions. Unfortunately these are very poor substitutes and do not elicit the same training response. Avoid these common mistakes and you can safely implement these into your routine. 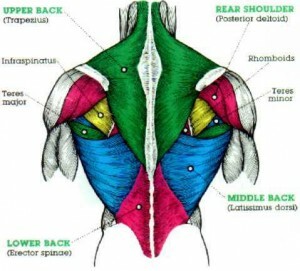 The main muscles of the back are the spinal erectors, the rhomboids, posterior delts, traps, and lats. It’s important to use a variety of exercises to target all these. While deadlifts will heavily recruit the lower lats and spinal erectors, rows and pullups are necessary to balance out your physique. Barbell rows will focus more on the posterior delts and traps, while pull ups recruit more lats. Both exercises also place an emphasis on the rhomboids. 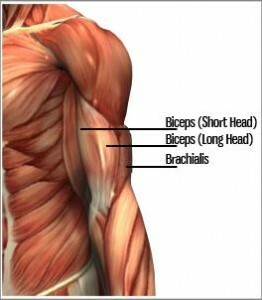 The biceps consist of two different muscles which consist of the long head and the short head. The long head makes up the peak while the short head is the thick part on the inside of the bicep. Exercises that focus on one head exclusively, such as preacher curls and drag curls, have a role in your workout program but not when it comes to increasing strength. Instead, focus on these two movements which recruit both heads. The triceps are made up of three different heads. Different kinds of extensions can target each head individually, but for building strength we need to recruit all of them at once. Increasing your tricep strength can help you add weight on a multitude of exercises such as the bench press and military press if triceps are your “weak link”. These two movements are excellent at adding mass and thickness as well. When doing dips with an emphasis on triceps, you will be in a more upright position and use a smaller range of motion with elbows tight. Bench press is the go-to when looking to increase strength in the upper body. Unfortunately it’s another classic strength exercise that leads to many injuries, usually a shoulder issue like a torn rotator cuff. Because of their inability to maintain shoulder stability people often resort to substituting pressing machines which elicit nowhere near the strength response as a barbell when you’re forced to stabilize yourself. 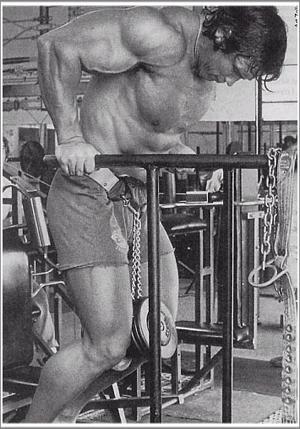 Dips are also a vital movement for pec size and strength, in fact, Arnold claimed these as his favorite chest exercise. In order to place more emphasis on the chest over the triceps, try to lean forward into the dip a little bit. Allow for a slight flare in the elbows and a deeper range of motion than a tricep dip. 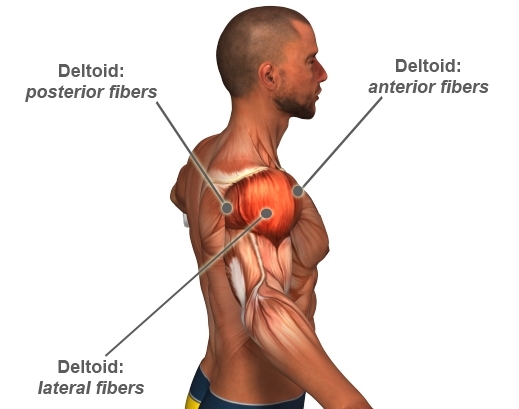 The deltoids are comprised of 3 heads: lateral, anterior, and posterior. Exercises like lateral raises are great for sculpting fine details but must be supplementary to these strength and mass builders. The military press will recruit mostly the anterior and lateral head while using the posterior head to stabilize the movement. In order to recruit the posterior delt as a prime mover a pulling exercise is required, and upright rows are the best choice. They will recruit all three heads but with more of an emphasis on the posterior delt. No matter what kind of workout split you are doing, you should typically start your workout with an emphasis on strength using the exercises that are the most taxing on your CNS system. Before you move to higher reps of more isolation exercises or machines, make sure to perform 3-5 sets of the strength focused exercises listed above. Keep the reps under 6 and take 2-5 minute rests in between sets when doing heavy compound movements. Also starting with strength exercises will fire up your neural connections and help you recruit your muscles more efficiently as you move on to isolation exercises at higher reps.
Alternatively, you could implement one or two “power” days a week where your whole focus is on compound movements and increasing strength. This is best performed as a full body workout or an upper/lower split. Here’s an example of an upper and lower power day. The other days could have more of a hypertrophy focus using more volume and isolation work. Its hard work throwing around heavy weights and building up strength! Follow these tips to make sure you’re maximizing your efforts. Get in the right “head space.” A large part of strength training is in your head. You have to be able to get the adrenaline pumping and get yourself amped up to reach new levels of power. So take Sheer Strength Pre Workout to get your blood flowing and your mind right for an intense, heavy workout. Get adequate recovery. This kind of training is very taxing on the CNS, and if you’re not recovering or sleeping properly, cortisol levels could rise and make it difficult to gain muscle or lose fat. Aim for 7-8 hours of quality sleep and make sure to take off at least 1-2 days following an intensive strength focused workout. Strength training is essential for everyone and not only makes you better in the gym, but it will transfer to real life situations where that functional strength comes in handy. If you’re cutting, strength training will help you retain your muscle. If you’re trying to gain muscle, you’ll be able to lift heavier in the hypertrophy range (8-12 reps) once you have a foundation of strength. This leads to more total hypertrophy. Plus it’s pretty cool to be able to lift so much weight that everyone stops what they are doing in the gym to watch you. If you follow the tips outlined in this article, you’ll achieve a more dense muscular look that will surely turn heads. The post Essential Moves For Strength Training appeared first on .